Many people would choose to convert their Blu-ray collection to ISO images for the purpose of backing the discs up. With a Blu-ray ISO image on your computer, you won’t have to worry about the original disc being damaged as you can use the ISO image to create a new copy of the disc. But it’s not that easy to play a Blu-ray ISO image on PC as it requires specific player software. The simpler solution here would be to convert Blu-ray ISO to a more common video format, like MKV. To do that, MakeMKV would be a great choice. MakeMKV is best known for its ability to rip Blu-ray/DVD to lossless MKV. But that’s not the only thing it can do. It can also process Blu-ray/DVD ISO. You can use it to easily convert Blu-ray ISO to MKV. And it’s much easier to play an MKV video on your computer than an ISO image. What’s really great about MakeMKV is that the MKV video it creates is lossless, so you won’t have to make compromises just to watch the Blu-ray movie on your computer. The video and audio quality would be just as good as the original disc or the ISO image backup. With MakeMKV ISO to MKV conversion can be easily done. To convert Blu-ray ISO to MKV with MakeMKV, read and follow the instructions below. 2. Click the Folder icon under the menu bar to browse for the ISO image you want to convert to MKV. Sometimes the program might have problems importing or recognizing an ISO image. If you fail to import the ISO file using the Folder icon, try pressing Ctrl+O and import the ISO file again. 3. Set where to save the output MKV video in the output directory box. 4. 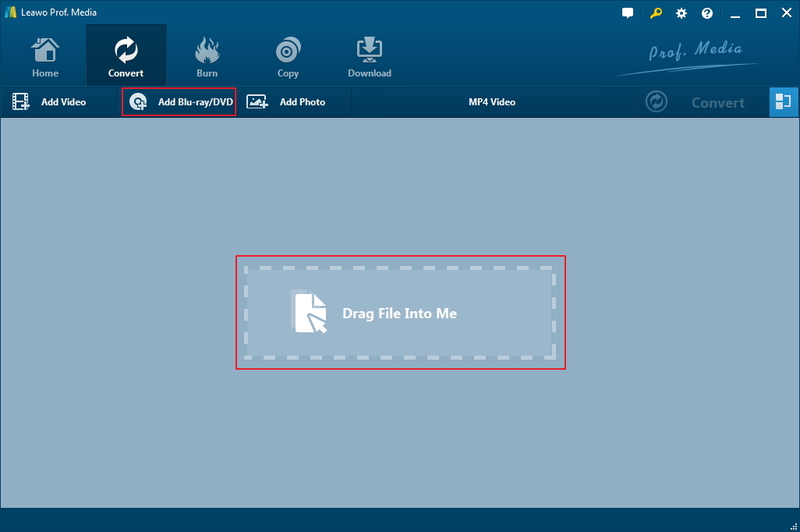 Click the Make MKV button in the upper-right to start converting the Blu-ray ISO to MKV. While MakeMKV is an incredibly powerful Blu-ray ISO to MKV converter, there are options out there that might outdo it. For example, Leawo Blu-ray Ripper is a very competitive opponent to MakeMKV. Like MakeMKV, Leawo Blu-ray Ripper is able to rip Blu-ray/DVD to lossless MKV video. And it does more than that. 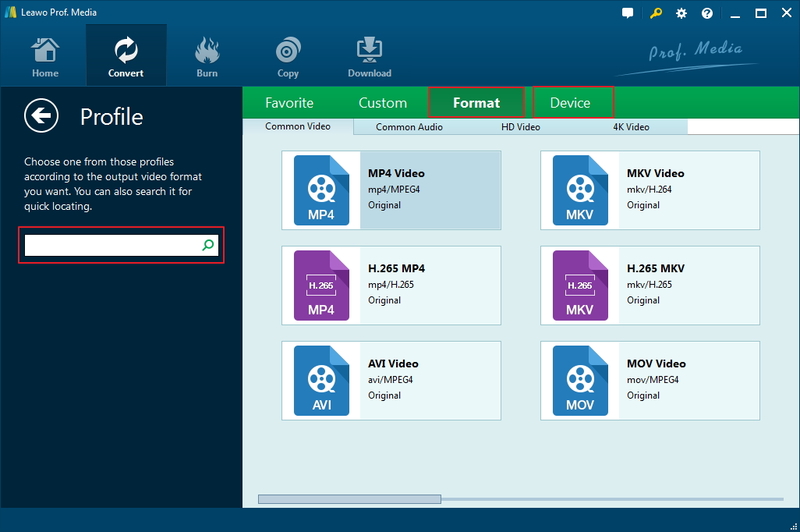 It also provides tons of other popular formats for output like MP4, AVI, WMV, etc. It can also process Blu-ray ISO files and have them converted to MKV with ease. Unlike MakeMKV, Leawo Blu-ray Ripper is a component inside a large software suite. The software company uses this method to create a combination of different software and help users process their media files efficiently. Below’s the guide to walk you through the Blu-ray ISO to MKV conversion with the program. 1. To open Leawo Blu-ray Ripper, first start Leawo Prof.Media on your computer. 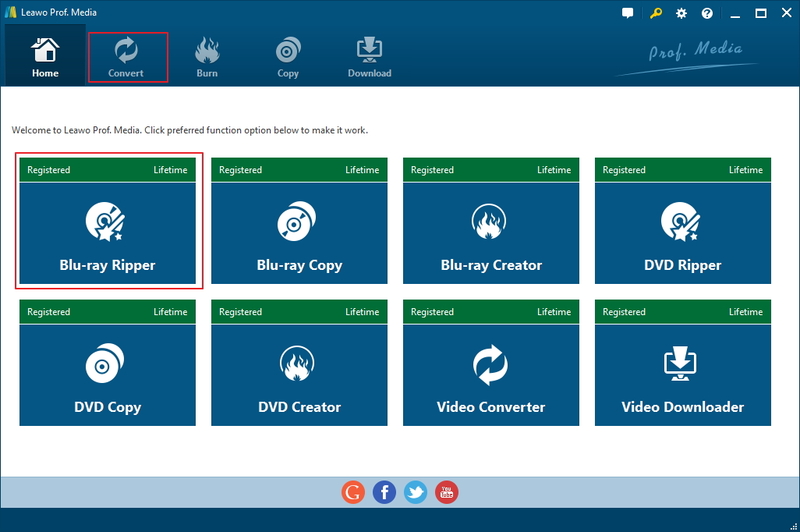 The shortcut for Blu-ray Ripper is shown on the main interface of Prof.Media along with 7 other shortcuts for other modules. Click Blu-ray Ripper tab to open Leawo Blu-ray Ripper. 2. Find the Add Blu-ray/DVD button from the upper-left of the interface. Click on it and there would be a drop-down menu with 3 options. To import the Blu-ray ISO file to the program, click Add iso file and then browse for the Blu-ray ISO file that you want to convert to MKV. 3. If your Blu-ray ISO file contains more than one video in it, then you can use the 3 buttons on top of the video list on the left to select different videos to convert to MKV. I would assume that now that you’ve had the original disc converted into an ISO file, the ISO file would have included all the videos you need. In that case, you can directly choose Full Movie to have all the videos in the ISO image converted to MKV. But in the case that you want to exclude some videos, select Custom Mode and you will find that you would be allowed to select the videos you need from the video list. The usage of the Main Movie button is obvious, to select the main movie from all those videos. Click OK and the program will have the videos you select imported to the video list for other settings. 4. Choices for output formats are abundant. You have the regular MKV video and the lossless MKV format. If you like watching movies on your phone, you can also consider converting the Blu-ray ISO to MP4 with Leawo Blu-ray Ripper. To select the format you need, click the Format button which is labeled MP4 Video by default on top of the video list. And then click the Change button on the menu that follows. When you see the Profile panel, you can browse the format list and look for the output format you want. You can find the regular MKV format profile in Format>Common Video and the lossless MKV profile in Format>Lossless Video. Directly click on the profile to make it the default output format. 5. Next to the Format button is a Convert button. Hit this button and a sidebar would pop up above the video list. You can see the default output directory on it. You can reset the directory if you want to. Then start to convert Blu-ray ISO to MKV by hitting the Convert button at the bottom of the sidebar. Below is the video guide that shows you how to convert Blu-ray/ISO to common video with Leawo Blu-ray Ripper. That’s how you can convert an ISO file of Blu-ray to MKV with Leawo Blu-ray Ripper. If you have Blu-ray discs that you haven’t backed up, you can also use the program to rip Blu-ray to MP4. We make Blu-ray backups so that when the original disc is damaged, we can have a fallback. What’s causing us to worry about the disc is its durability. You will find scratches on a disc no matter how careful you are when dealing with it. Scratches come from a lot of different places. If you do have a Blu-ray disc with scratches accumulating on its surface, check out how you can fix them by yourself. Dip a software microfiber cloth in warm water and plop on a small drop of dish soap on it. 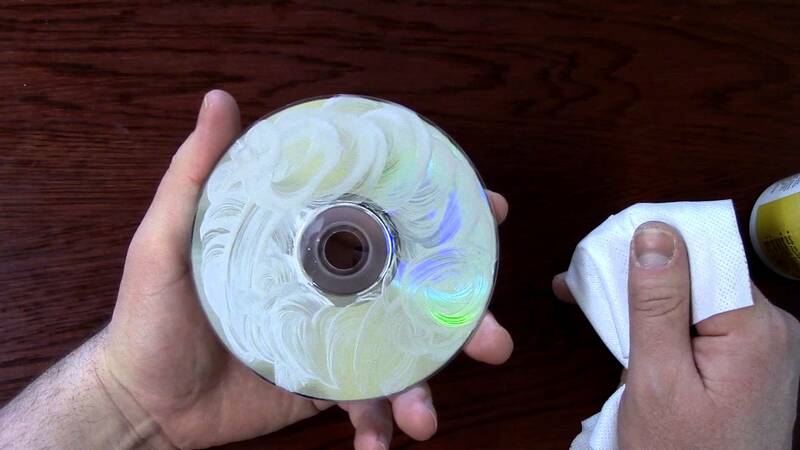 And then use the cloth to rub the surface of the disc gently in a circular motion. And then clean it with a nonabrasive cloth. 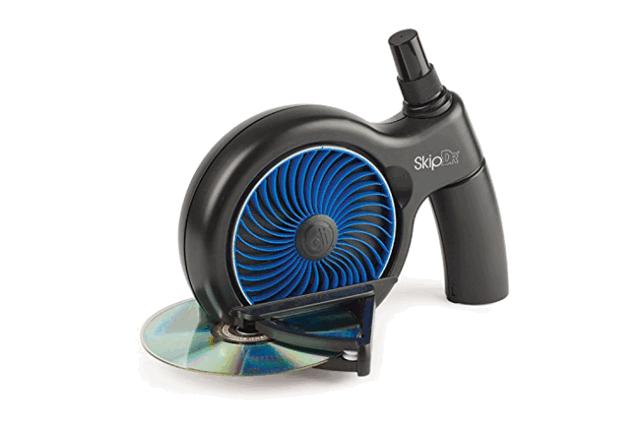 There’s a tool called SkipDR that can repair scratches on Blu-ray/DVD/CD discs you can try.